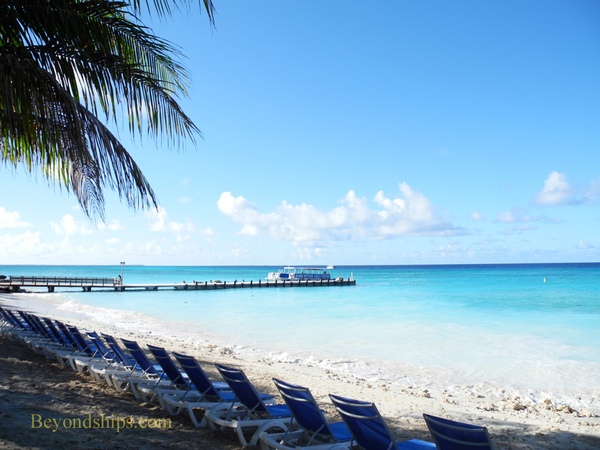 Grand Turk is a rapidly developing cruise destination. In some respects, it is still reminiscent of the way Caribbean islands were in the middle of the last century. The pace of life is still unhurried and the island is largely free of fast food restaurants and traffic jams. Its beaches are still unspoiled and the buildings of its only real town, Cockburn Town, harken back to the Caribbean colonial era. At the same time, however, Grand Turk is developing a 21st century tourist infrastructure. Its cruise center complex is state-of-the-art with resort-style beaches, recreation facilities, restaurants, and shopping. A new visitor-oriented shopping complex is also being built in Cockburn Town. Because the island is in the midst of change, it offers two types of vacation experience. If you are looking for a modern Caribbean resort holiday, it is literally at the end of the pier at the cruise complex. If you are looking for a taste of the traditional Caribbean, the rest of the island still offers it. Of course, it is possible to do both. It is not a very big island - - only about six miles long and one mile wide. Nor is it very crowded - - only about 4,000 people live there. Thus, on a day when two large cruise ships are calling, there are more visitors than locals on the island. Grand Turk is the capital of the Turks and Caicos, a British overseas territory. Tourism, along with overseas finance, has been the mainstay of the economy for some time. 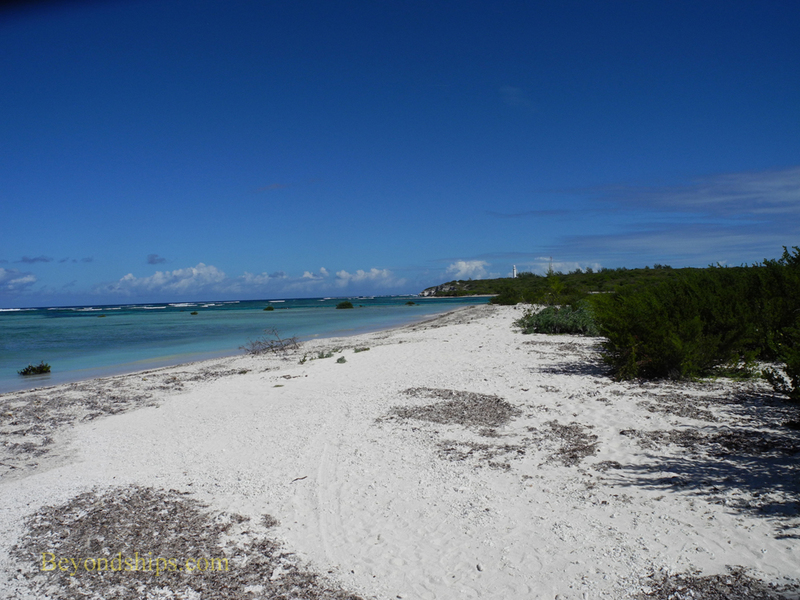 However, until recently, most of the tourism was confined to the upmarket island of Providenciales. The Turks and Caicos is made up of two island chains: the Turks Islands and the Caicos Islands. They are separated by a deep stretch of water known as the Turks Island Passage. There are hundreds of islands in the two chains but only eight main inhabited islands. The islands are not actually in the Caribbean. Rather, they are in the Atlantic Ocean southwest of The Bahamas. 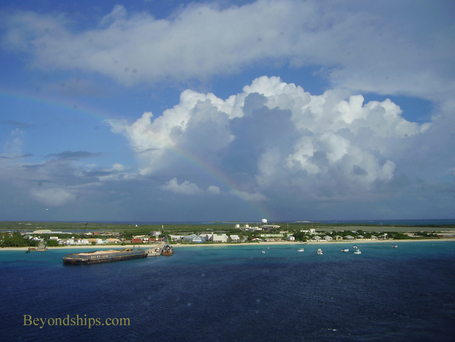 Like the islands in The Bahamas, Grand Turk is a low lying island built on limestone. Although there are salt ponds, there is little fresh water. As a result, areas of the island have a desert look. Indeed, a Turk is a type of cactus. 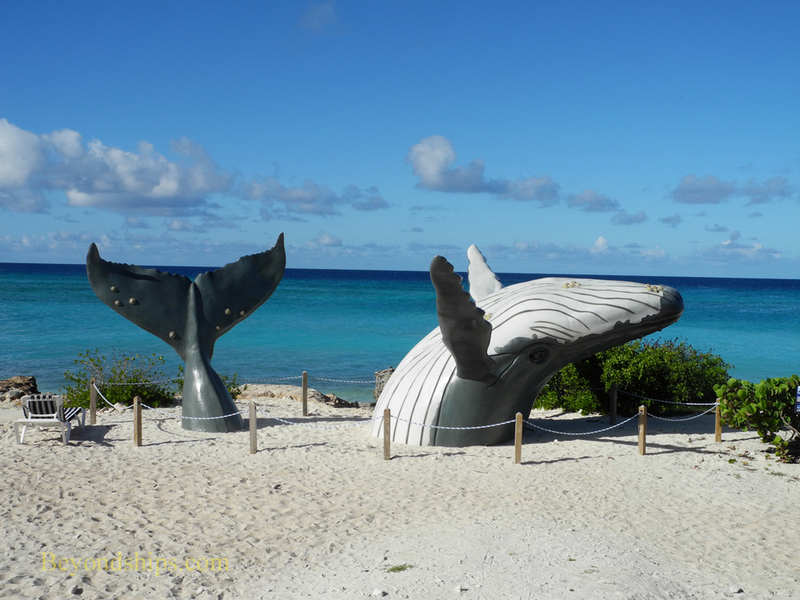 The real beauty of Grand Turk is found along its shoreline. The beaches have white sand and the water in very clear. It is part of the world's third largest barrier reef and the waters around the island are known as a diver's paradise. During the winter, from January to April, thousands of humpback whales traverse the waters of the Turks and Caicos on their way to their breeding grounds in the Caribbean. They swim close to the surface and can be seen from the islands as well as from boats. Above: Grand Turk is a low-lying island with few hills. 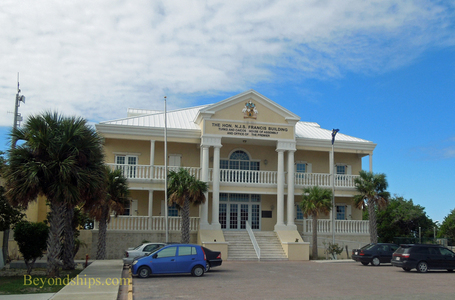 Below: The home of the Turks and Caicos government. Above: A monument to the humpback whale. 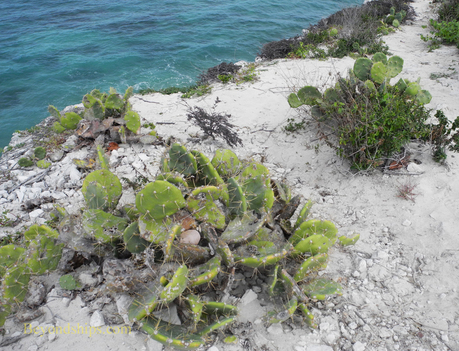 Below: Cactus underscore that the interior of Grand Turk is quite arrid.